Find out about the Earth. A comprehensive introduction to physical geography including information on the climate, volcanoes, erosion, the weather, ecosystems and humans. Fabulously illustrated with photographs, maps, diagrams and illustrations that will capture the imagination of young readers. Includes an extensive glossary, fact finder and world records. With internet links to recommended websites with maps, quizzes, games and homework information. 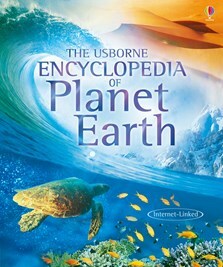 The material in this book is also available as part of the Usborne Geography Encyclopedia.